These Trees usually grow about six Inches thick, and twenty Feet in Height, having a smooth light coloured Bark. 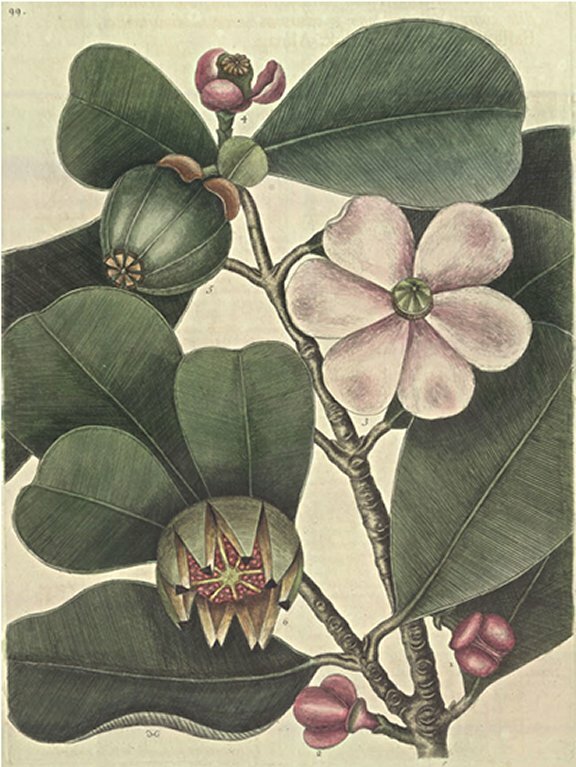 The Leaves grow by Pairs, they are thick, and succulent, having a large Rib in the Middle, from which run transversely narrow streight Lines, parallel and close to one another: In June it produces ample fair Flowers, composed of six white Petals, stained with purple In the Middle of the Flower is formed the Rudiment of the Fruit, which is almost spherical, and increases to the Size of a midling Apple: From the Stalk to the Crown of the Fruit runs eight Lines like the Meridians on a Globe, from Pole to Pole. When the Fruit becomes ripe it opens at these Lines, and divides into eight Parts, disclosing many mucilaginous scarlet Seeds, resembling those of a Pomgranate, the Mucilage being washed off, the Seeds appear white, and hard, containing a Kernel. These Seeds are contained in the hollow Furrows of an Octogonal Core. The whole Plant is exceeding beautiful, and particularly the Structure of the Fruit in all it's Parts, is a most exquisite Piece of natural Mechanism.